For over 25 years, Bob Heinmiller Air Conditioning, Inc has served local families as a dependable service for heating and air and as an expert electrical contractor for Orlando and the surrounding communities. Our professional electrical services are completed by certified and licensed electricians, trained to the highest industry standards and NATE certified. An Orlando electrical contractor will arrive at your door uniformed and badged, having completed extensive training and detailed background checks. We are qualified for work on residential, commercial, and manufacturing facilities. As the premier electrical contractor in Orlando, we pride ourselves on quality service and notable results. Whether you are constructing new additions or remodeling your current location, our skilled experts can provide solid installations without stress or hassle. We service light fixtures, fans, hot tubs, and more. When you need competent rewiring in the home or even an added power line to an outdoor shed, we have the expertise and knowledge for you. If your business relies on expensive electrical equipment or stores of irreplaceable computer data, then surge protection from lightning strikes faulty appliances is a crucial asset. We also assist with exit signs, emergency lights, and parking lot lighting to increase the safety, comfort, and usability of your facilities. 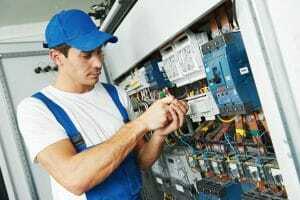 Inevitably, times will come where you need the assistance of an electrical contractor in Orlando for wiring becomes damaged with age, lights become shoddy and unreliable, or AC circuits fail. We specialize in troubleshooting difficult problems with detailed assessments, including storm damage and insurance claims. Avoid the stress of unexpected service emergencies and save money with our annual inspections. With a comprehensive analysis of your electrical system, we can pinpoint potential fire hazards and reduce the risk for untimely electrical failures. Customers who take advantage of our preventive maintenance service receive a 10 percent discount on future service calls. Ensuring a constant power supply in your home or business does more than keep you in comfort while your neighbors are forced to wait through power outages. A standby generator maintains your security system and guarantees safe, adequate lighting in as little as 10 seconds after a power failure. You can receive same day emergency service 24 hours a day, any day of the week. There will never be fees for overtime or travel charges, no matter how major the work. Dedication and workmanship in an electrical contractor in Orlando are what you deserve, so call today.